Recent time spent with a DAB tuner simply confirmed that BBC Radio 3's presenter-led daytime programming is an embarrassing disaster. But sadly, hiving off the presenters to Classic FM where they belong is no solution. Because Radio 3's flirtation with presenter-less Mixtapes programmes is an even bigger disaster (mixtake?). 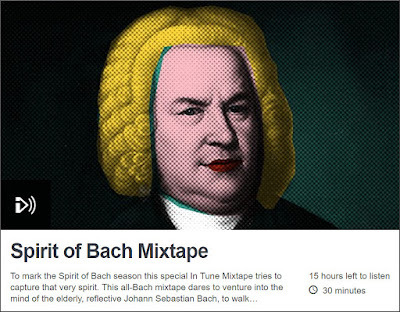 Just as the station's dumbing down of presenter-led programmes is a futile attempt to recapture the mass audience low ground from Classic FM, so the cringe-inducing Mixtapes are a futile reaction to the very popular Spotify playlists. The same disruptive technologies that disrupted the record industry are now disrupting the broadcast media. But Radio 3 refuses to accept this, and instead insists on a fruitless survival strategy of emulating commercial stations and streaming services. This despite having none of their competitive advantages but having many, many competitive disadvantages. I worked for the BBC and Radio 3 provided much of my music education. But, despite this, I firmly believe that Radio 3 cannot and should not survive in its present form. Radio 3 must surrender the mass market low ground to Classic FM and the streaming playlists. But what it must not surrender is its unique competitive advantage of being a patron of high quality live music via its orchestras and other ensembles, and via the Proms and other concert series. Radio 3's ratings are not responding to attempts to capture the classical low ground, and drastic action is required before the station's life support machine is turned off by the suits. Eliminating cost and restoring competitive advantage by radical action such as the wholesale dropping of Classic FM-cloned programming and replacing it with archive recordings from the BBC's priceless library of concert performances is one way forward. Forsaking FM/DAB wavelengths altogether and emulating the highly successful BBC Radio 6 by becoming an internet-only station streaming live concerts and archive recordings is another. The livelihoods of five leading orchestras and a choir, and the future of the largest new music commissioning budget in the world depend on the healthy survival of BBC Radio 3. You only need to listen to Radio 3's daytime programmes to understand that the patient's vital signs look very bad indeed, and to realise that drastic and painful surgery is urgently required to provide any hope of survival. I can only agree; just last week I was driving from Somerset to Oxford and tuned into BBCR3 after "Today" finished on BBCR4. Awful programming with stupid "quizzes" answered by three retired blokes and a Jack Russell. Same old music all the time (I'll scream if I hear Rimsky-Korsakov's "Scheherazade" just one more time - even if it is Muti's peerless Philadelphia recording). Whilst I'll give Rob Cowan a break as, occasionally, he can get away with playing something like Artur Schnabel's Beeethoven, the rest has descended into babble, inane chatter, and irrelevance. When you think of what the BBC has in the vaults its so frustrating. Wouldn't it be nice to hear William Wordsworth's symphonies, some Arnold Bax string quartet, "historic" Edmund Rubbra symphony broadcasts, or even Max Reger's violin concerto? I suppose we will have to continue to rely on Lyrita reissues from the Richard Itter archives for enlightenment, but that can only ever merely scratch the surface. We know that the BBC is supposedly strapped for cash but the men on air seem to be paid eye-watering "salaries" compared to many of the women (who do quite well enough, in reality). I'm told by a friend who is a BBC journalist that the local 18:30 BBC news programmes can't be broadcast in HD as there is no money for it. Maybe some of the so-called "stars" might chip in to help? Think about it, BBCR3 has enough stuff in the archives (at least I hope it has) to continuously broadcast for many years before the seam is exhausted and the cost of doing so would be piffling. I have ploughed my own furrow in learning about classical music. I don't know anyone who I could call upon to guide and cure a growing love of Classical music. I have relied on Radio 3 to point various directions and will always be grateful. I'm very sensitive about the fact that I'm out of place and am not the "right" sort of person to be in love with the music. This article reads to me as the work of somebody closing the door on people like me. I hope I'm wholly wrong about this.